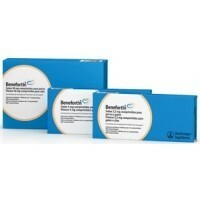 Benefortin Flavoured Tablets 20mg for Dogs is for the treatment of congestive heart failure in dogs. Each tablet contains 20.0mg benazepril hydrochloride (equivalent to 18.4mg benazepril). Found these to be the cheapest online. My vet wanted to charge me £90 to sell them directly to me! Service was excellent - fast responses to my emails and tablets arrived within two days of placing the order.